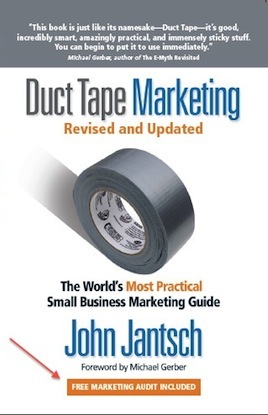 Duct Tape Marketing is the small business marketing road map – A collection of proven tools and tactics woven together in a step-by-step marketing system that shows small business owners exactly what to do to market and grow their businesses. When it was released in 2007 it instantly become a small business marketing book classic and has been read, cited and used to build tens of thousands of small business marketing plans that are simple, effective and affordable. There are no theoretical complexities presented in Duct Tape Marketing – just simple, effective and affordable marketing that sticks. Bonuses when you buy now! You also receive . . .
A Signature Brand Audit is a free 30 minute session with an Authorized Duct Tape Marketing Consultant to review your existing marketing, give you a quick snapshot on the effectiveness of your web site and suggest several ways to make improvements right now. This is like receiving a guided tour of the main principles contained in the book.